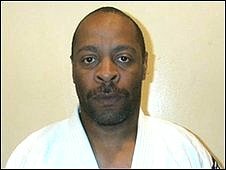 A former Olympic judo finalist who acted as "enforcer" for a £50m drugs gang has been jailed indefinitely. James Waithe, 47, from Bristol, collected debts for an armed gang that netted up to £1m a week from cocaine sales, Bristol Crown Court heard. He was convicted of drugs and firearms offences at the court last month. Judge Simon Darwall-Smith passed a nominal sentence of 18 years and Waithe can only be freed when he is no longer deemed to be a threat to the public. He told Waithe: "You had a reputation for violence. You were [gang leader] Rodel's muscle and enforcer. "At one stage you poured boiling water over a victim. "During another incident you held a man as Rodel put a lighted cigarette in his ear." He taught PE and citizenship at Withywood Community School and Bristol Gateway Special School. During the trial the court heard officers were called to a reported burglary at Waithe's Highridge Green flat and found a "cocaine factory". They discovered a 10-tonne hydraulic press, drugs and cutting agents. They also uncovered an arsenal of weapons including rifles, handguns, stun grenades and ammunition. Waithe told the court he owned the flat but did not live there and had nothing to do with the illegal enterprise. The jury heard that part of Waithe's role included extreme violence. Prosecutors claimed he once tied a man to a chair, beat him with nunchuks, extinguished lit cigarettes in his ears and put his hands into an electric toaster. Waithe was found guilty of conspiracy to supply cocaine and possessing a firearm with the intent to danger life after a trial in November. His co-defendant Robert Brooks, 63, of no fixed address, was earlier found guilty of conspiracy to possess explosives, namely stun grenades. He also admitted conspiracy to supply drugs. He was also given an indeterminate sentence today, with a 14-year nominal term. Grant Richmond, of Long Cross, Lawrence Weston, and Craig Rodel, 46, of Wexford Road, Bristol, and Luke Downes, 22, of Pevensey Walk, Bristol, have all pleaded guilty to being involved in the conspiracy to supply drugs. They have yet to be sentenced.